While we're waiting for Star Wars: The Old Republic (and BioWare is now taking applications for closed beta testing if you're into that sort of thing) maybe this'll satiate your appetite in the meantime. About five years ago Star Wars: Knights of the Old Republic II came out but instead of BioWare doing the follow-up to their original game, work was contracted out to Obsidian. Now don't get me wrong: Knights of the Old Republic II was a superb game ("some" people, ahem, even claim it's better than its predecessor). But even the most casual players found that there were obviously things... wrong... with KOTOR II. Some more tech-savvy folks went looking through the game's CD-ROM discs and found huge chunks of content that Obsidian had intended to put into the final version, but for one reason or another chose to instead yank it out. But the "missing" resources, like cutscenes and dialogue and even an entire planet (to say nothing of that elusive HK droid factory) were still there amid the files. And it wasn't long after the game was released that a community of fans coalesced together to modify the game and restore the deleted material. It's taken nearly five years, but at long last the Knights of the Old Republic II Restored Content Project is darn nearly in its final form. The developers are calling the latest version of their mod an "open beta", but by all accounts this is the game as Obsidian first envisioned it. 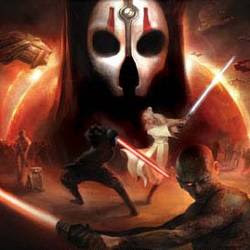 The modders are recommending a clean install of Knights of the Old Republic II and using no previously saved games. Here's the current complete list of download links and other info on the project's official website.